I am intrigued when I see similar recipes being cooked in different parts of the world. It makes me wonder how recipes travel or how they evolve similarly in different parts of the world with their own different climates and different produce. 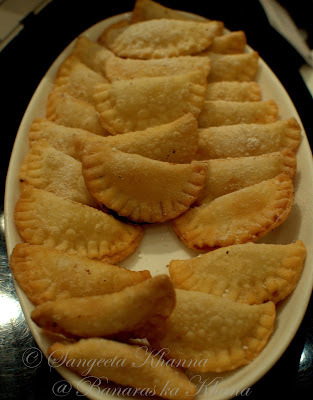 Long time ago when I started reading recipes online, I saw a puff pastry made like our Gujhia with a peanut stuffing, the similarity made me wonder how similar shapes of puff pastry might be just a basic way of folding a circular piece of rolled out pastry sheet. Geometry has a definite way of behaving and we witness it in such things. White flour was definitely made popular after the industrial revolution in Europe so the pastry sheets took a natural course of evolution. 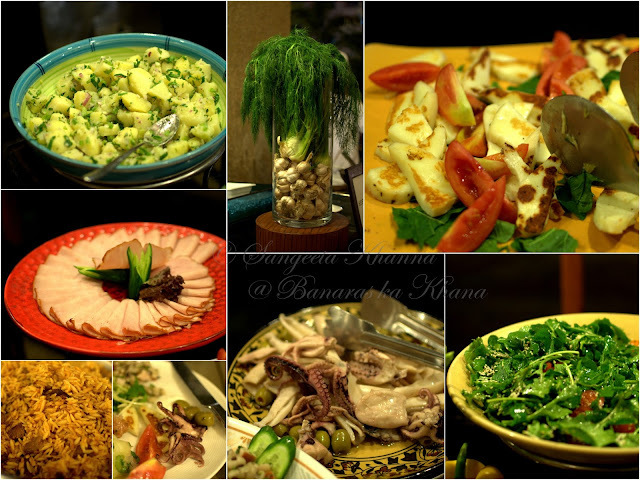 I was flummoxed with surprise once again when I was at a Cyprus food festival going on at Eros Hotel, Nehru place. 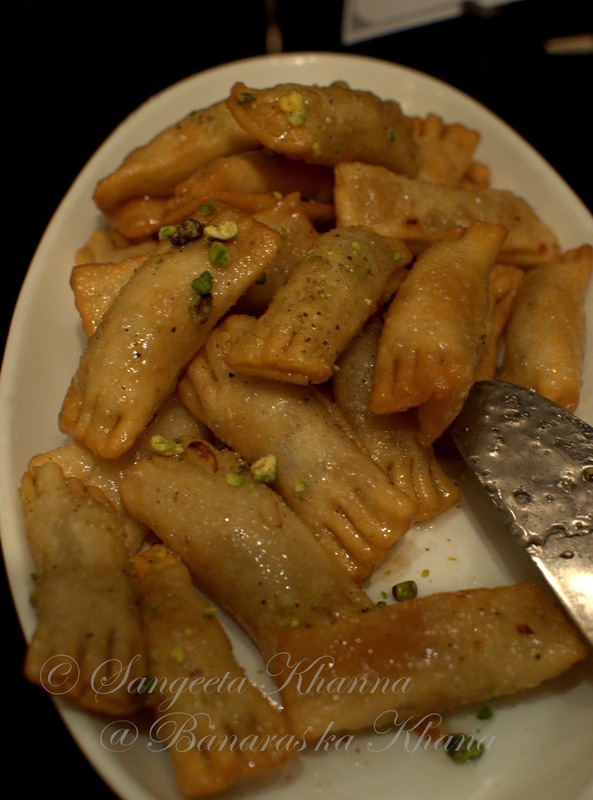 I shall tell you about the main course dishes later, the desserts made me glad by sending me back into the lanes of Banaras where Lavanglata rubs shoulders with samosa. Look at this rolled and shaped like a cylinder, stuffed with nuts dessert. A Cypriot counterpart of Lavanglata. Called Daktyla in Cypriot. And here is the Gujhia. Milder flavors on the stuffing, but unmistakably the same feeling while biting into it. Called Pourekia in Cypriot. Now some Bihari readers would say even the name is similar with Pedakia (Gujhia is called pedakia in Bihar). A multi layered puff pastry stuffed with sweetened semolina and evaporated milk also belongs to the same family. Called Galaktobourekko. There was a Rizogalo, similar to rice kheer we make here and there was a Halouva too. 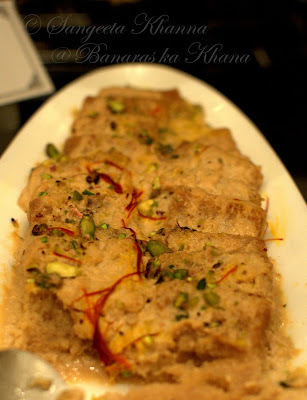 The same sooji ka halva so popular all over North India. The desserts made me glad by this connection they had with my homeland. The starters and main course was a lot different from what we here in India. I liked the fresh salads with Rocket greens and tomatoes etc as I always do, but the Haloumi was chewy and dry. I had high hopes from Haloumi, Cyprus being the country of origin I was dreaming of soft melt in the mouth haloumi once I decided to go to this festival. 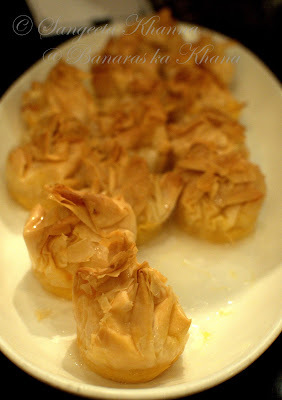 I would tell you what I liked among too many (to choose from) seemingly mediocre dishes on offer. There were two types of cured meats, Hiromeri (smoked pork leg matured in red wine) and Lountza (smoked pork belly) that were great with a salad called Horiatiki (Greek country style salad). There was some pickled Octopus, chewy and intense seafood taste which might be a problem for some. It was okay for me. A potato salad a Beets salad and a yogurt and cucumber dip called Talatouri was interestingly similar to Indian salads we make. On the live counters there were Keftedes, meat balls made of Lamb and chicken. They were quite good. On the Live grill there was really succulent Prawns and chicken skewers. In the main course I liked a stew with green beans and chicken, it was quite a light stew, like the ones I make at home so I liked it, But the dish was not good to look at, do not skip it if you like stews. Pork Affelia is braise din red wine and seasoned generously with coriander seeds, very interesting. I liked a Lamb Giouvetsi which is a pulao like dish with Risini or Orzo pasta(pictured in bottom left in the above collage). I also tried a broken wheat pilaf which was a good way to eat some whole grains and tasty too, if eaten with the stews of meat on offer. The good thing with such festivals is, if you don't like to taste all of the dishes on offer, you just pick up what you like and then choose your pick from the regular buffet of the other side. Here are some more desserts, the top right is an interesting fruit leather rolled with almonds in the center, called Soutzoukos. There were a lot of regular desserts on display as well to choose from. This Cyprus festival is a must try if you want to taste a new cuisine, they have flown in Chef Soteris Lordanou and Chef George Katastrofas to put it together. 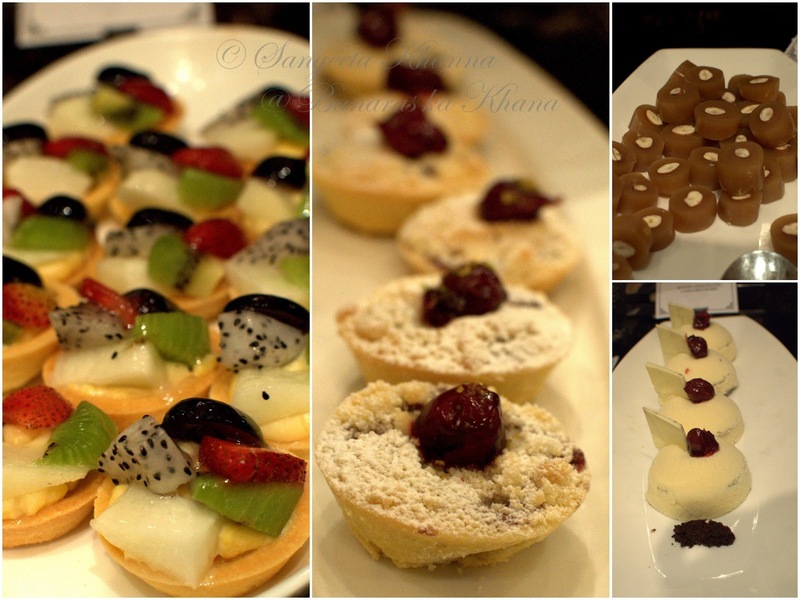 And tell me if you wont be surprised to see a gujhia, lavanglata, kheer and halwa on the dessert platter. Wow the spread looks delicious.